If you lead a life without having any expectations either from yourself or from others, you will be in a position to propel your cart in a decent manner. In that case, it will be full of purposes, and then you will not bother about death. If you happen to read the holy sonnet no 10 of John Donne’s “Death, be not proud,” you will find that he has challenged the supreme power of mortality. He says death itself is dead. No one should be afraid of him. In fact, he narrates that why should we afraid of him, if we lead our lives ideally. In reality, of course, we are afraid of death considering the same as a monster. If we receive the news of the death of our family members, our neighbors or our friends, we get dejected, and not able to come out from the grief for a long time. In this way, we develop a perception and make a cynical inscription about death in our mind. But if we consider the sequence of death as a natural phenomenon, we will be in a position to adjust our thoughts. It is our culture to view death as a not that peaceful happening. Without debating the inner meaning of the holy sonnet of Donne, one can say that death is also a blissful sequence of life. One who is born has to die, and there is no alternative. But if you lead a meaningful life, you will take death as a part of life. The Buddhists meditate to seek the nature of death for three fundamental reasons. Firstly, it makes us conscious of the impermanence and shortens of life and makes our life purposeful. 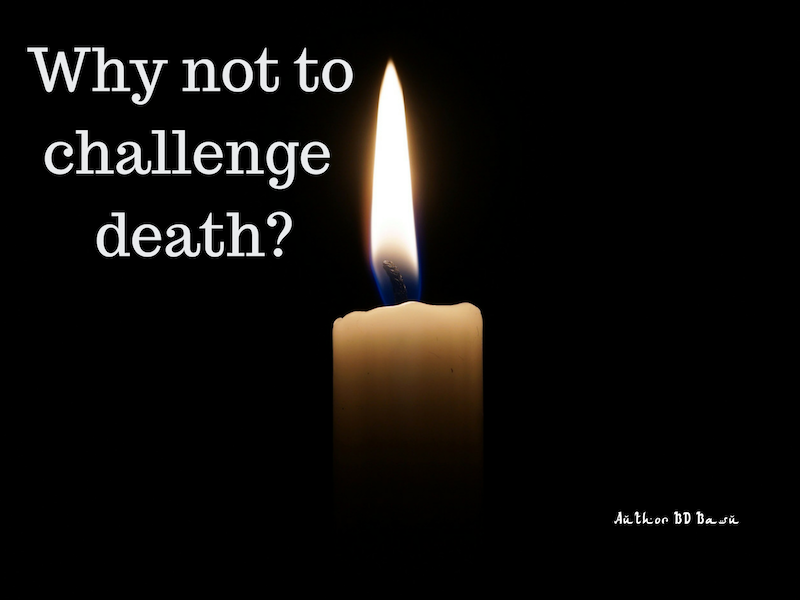 Secondly, contemplation about death makes us understand its realities. Through the deep level of understanding of this process, the phenomenon of mortality familiarizes us with dying and we become aware that our life is not immortal. Thirdly, contemplation of death provides us with an opportunity that life has a limitation of age, and so it is precious. It then makes us realize that let us live fully. As per Buddhist monks, death is “the separation of the most subtle body and mind from the more gross aspects of the body.” As per them, one should not consider death as time, but it is a gradual process. A living person consists of gross and subtle mind and body. The definition of this body means the physical body, which consists of muscles, fat, and bones. The mind is all about thoughts as to how you control and utilize the same. It also includes feelings and mental stresses. When death is soon approaching in life, the coarser mind stops and gives rise to a subtle mind. Our mind is getting filled with vacuity. We become unconscious. Death happens when all our responsibilities are over. If you feel that you need to continue with your routine activities for more time on the earth, you can afresh concentrate on the being of yours, and do all the necessities. The physical sign of death, consciousness leaving your body are the cessation of heat from the chest, which is the region of the heart. Through exploitation of heart, you can identify the conceptual idea of death and also develop a habit to appraise, whenever there is a new issue of development. When you are aware that the consciousness has left, then the body becomes an empty shell. The cycle of death is only over when the soul ultimately leaves one aggregate of gross and subtle body and attaches another aggregate. We always talk about that the new being, which must be a person only. Depending upon the karmas, speech, task, and accomplishment he has done at the time of death, he can take the physical entity after reborn as “Preta,” or in some other forms. The Preta God could be a hungry ghost, Asura (a jealous God), and even a God himself. In Buddhism, if one commits suicide, he will be condemned for an extended period. Another reason for having committed suicide is full of negativities and frustration. Apparently, this phenomenon gets replaced in the next birth of the particular person. The process of reincarnation happens within a period of 30 days. The state of bliss at the time of death is important from a future point of view. Buddhism suggests not disturbing the dying person showing extra baggage of emotions. Such an appearance and attachment to the dying person may jeopardize his dying seriously. His soul may also be affected, who knows? Finally, there will be a change in the process of reincarnation. So; it is always advisable that you allow the person to go peacefully. If you lead your life following an ideal code of conduct and remembering God in all your endeavors with religious fervor, you will never be afraid of death. In fact, many people work and maintain regular routines in their lives till the last day of life without bothering much that death will be a painful incident shortly for them. When the time comes, they only pray, chant some hymns may be in the lying position or tell the family members to make them hear religious songs, and in the midst of the same, finish their last breathing. There are even people who die without the knowledge of any of his family members in their sleep due to a massive heart attack. Though it may not be a peaceful death, it is not that painful also. The individuals who are most afraid of death are those who have no in-depth idea of death at all. It is the end of the beautiful life, which God has kindly provided us, but we have not managed it right to the norms of ideal living. And in this process, we become gloomy whenever there is an incident of death, or we receive the information of end of life.